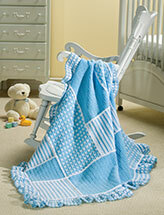 This cute blanket is so easy to make! Your child will love to snuggle with this at night. Change the background color to fit your little one's preferences! Size: 40" x 40". Made from medium worsted weight yarn and size H/8/5mm crochet hook.